A thumbnailer for Krita files (*.kra) and Open Raster files (*.ora compatible Mypaint, Gimp, Krita and Pinta) for Linux : Gnome 3.x File ( Nautilus ) , Cinnamon ( Nemo ) and other compatible GTK3 compatible file browsers ( File of Elementary OS, Nautilus fork of Ubuntu , probably even SpaceFM Gtk3 ). License: CC-BY David Revoy, www.davidrevoy.com, 17 january 2016 . @lewatoto : Thanks pointing me it ; indeed a typo I made while writing the documentation. Fixed :) Nice to know it works also in Fedora too. Did you change only the desktop environment or the complete distribution? À part ça, la commande pour quitter Nautilus (nautilus -q**) ne marche pas chez moi mais ça n'a aucune importance. @flem : Merci Flem ! C'est déjà modifié et désolé pour abuser de mes testers avec mes typos de documentation . Oh, you moved to GNOME... As long as you continue to amaze us with your artwork it does not matter, I am still a fan :) I am sorry I missed you at Capitole du Libre, will be more careful next year! @Aurélien Gâteau : Hey Aurélien ; thx ! yes, too bad we didn't met. I was around very long. I'll keep my system hybrid for long time , I think. Thank you for the thumbnailer, really useful and it was really easy to install. Cheers! Très utile, bravo et merci beaucoup !!!! I'll check the recent video review of Antergos on the Linux Action Show. But why did you move from your previous configuration? (Mint+Kde I think to remember) Are there particular advantages? I wonder how Steamos will be, because I would like to learn how to use Hammer and get into games from the Modding point of view. @Marco : Hey, I'll do a next article about it ; but in a nutshell ; Wacom and color calibration support is way better on Gnome 3 ; also the compositor performances are now good. So, it's good to can work on a modern desktop. About SteamOS ; I have no opinion yet ; as I still don't know the architecture, the toolkit or code who will be used for display. I just hope it will be based on a popular existing desktop ; not reinventing the wheel again on Linux. @André : Hi André. Becarefull : Mint team got dev, but no Wacom user/tester ; so what happen is a total breakage of the Wacom tools AFAIR ; http://forums.linuxmint.com/viewtopic.php?f=49&t=151645&p=791245 ; I didn't tested. Sh**. What distro should I use instead with gnome 3.10? @André : I don't know. For the moment, and as far as I know. I don't recommend any Ubuntu based distro. Even Ubuntu Gnome edition is still 3.8. Here I use 'pamac' to install or remove package , it's really 'synaptic' like, and I update system with terminal ( rarely , when all works ). For building Krita, my previous article with building "Krita for cats" was proof tested by me 2 weeks ago on Arch and OpenSuse. I updated the wiki of calligra with correct dependencies list. Q: What are the SteamOS Hardware Requirements? Since a few days FEDORA 20 is available. It comes with Gnome 3.10. @Martin : Hi Martin, no. I'm really fine with Manjaro since last summer. It works, I have so no reasons to change. I gave a try to OpenSuse 13.1 Gnome 3.10 from end November ; but after the use of pacman and yaourt for Arch/Manjaro package management, any other solution feels complex to me. So this is for Gnome... how about KDE? I'm running Arch Linux with KDE. I have "extra/kdegraphics-thumbnailers" installed and still no .kra thumbnails in Dolphin. Any suggestions? @Storm : Hey Storm ; KDE teams ( well Calligra teams .... Well , Krita team ) was first to implement a cool thumbnailer. You can find a screenshot about how to activate here http://www.davidrevoy.com/article155/linux-mint-14-kde-for-painters ( part 7 ) ; it should be labeled "Calligra files" in Dolphin Preferences/Preview options :-) Maybe they renamed it , or split open-raster from Calligra files (*.kra) . Good luck ! However, the option is missing from the list. No "Calligra images" or "Krita images" either. There is "Open raster archiving images" which is enabled but other than that, nothing. The only options not enabled are text files and some other specific non-image files. and THUMBNAILER_LIBS to avoid the need to call pkg-config. So... Maybe any issue with naming/path or version? @Mauricio Marinho : weird , here I have similar system 64bit version, had no issue compiling with what indicated on github. I've packaged a 64bit *.deb ; might be easy http://www.davidrevoy.com/XYZ/gnome-kra-ora_1-1_amd64.deb ; also it works only with Nautilus and Nemo ; LXDE use PCFMan usually, or another file manager. The .deb package works fine! I'm using nautilus on my LXDE, freedom of choice is awesome like that. I have no problems with .deb files, also think they're easier to use since i'm relatively new to ubuntu (been using for 3 years now, partially because Blender > you > MyPaint :P ), some months ago I could not even compile stuff, so yeah, .deb and ppas are ok, even though I've read in a lot of places it wasn't ideal. It only showed me a warning when opening your .deb, saying there could be "serious" issues because you didn't write your name as developer somewhere, but I've just ignored and installed it. After cleaning cache and restart (don't know why reboot was required :)) I have kra and ora thumbnails in system. Maybe some1 find this info useful. Many thanks for the .deb, I was having the same difficulties as Przemek! However, I run several machines and a couple of them are old and only support x86 architecture, would you be willing and able to produce a .deb for x86? Thanks again as it works like a charm on my x64 machines! @el_silloneb : Hi ! unfortunately, I can't produce x86 ; I would need to buy a PC with x86 only to do it and I'll need to reinstall a 'buntu system. ( I'm on Antergos, right now, I 'm testing other distro ) You can build it on your x86 computer ; the full howto do it is on the README and it's not complex. I do the *.deb using 'sudo checkinstall' at the end ; so you probably can do the x86 package. Thanks for getting back so fast, sorry it took me a bit longer. One last thing; I've only just worked out that you're the guy making all the great Krita brush presets that I've been using for a while now so many, many thanks for those! They're greatly appreciated. About Antergos, I can't advice it anymore : last week was a little drama ; between Gnome 3.16 coming in arch repo + Plasma 5 being adopted to replace Kde4 and the Antergos team deciding to launch a new ISO and installer at the same time. I decided to move back to the 'buntu LTS ecosystem ( choosing Linux Mint 17.1 Cinnamon , and build on it Krita 2.9.2 myself ). I really understand you prefer GUI over CLI ; I really also do ! The problem on Linux is that maintainers of various 'extra' projects are fading like snow on the sun. The only distribution who got the ORA/KRA thumbnailer in the repo is Fedora right now. The one available for the Arch users in AUR is an outdated Gnome 2 ORA/KRA thumbnailer , for old nautilus. I'm even not sure if this old thumbnailer could work with Caja , the file explorer of MATE. Good luck selecting your distribution ; it's always really tricky. Just to let you know that *.ora files are not typically MyPaint files (if I'm not mistaking). They are "Open Raster" format.https://en.wikipedia.org/wiki/OpenRaster Which is not bound to any program. And Gimp can also open and write that format. Maybe more program will handle this in the future. I've been using it since the first time you posted and it has been working great, thx! So, it seems you've changing distros pretty frequently. Do you have any tips on doing it so frequently? I mean, I've been postponing doing a fresh update of Ubuntu and trying some distros (like Artegos, Kubuntu and Fedora or OpenSuse), but even the slightest idea of having to reinstall and reconfigure everything makes me tired. @Raphael Barros : Hey, the main tip I have is to keep the installation on minimum 3 partitions ; the root ' / ' , the 'swap' and one for '/home'. When I reinstall an O.S. I only overwrite the root ' / ' partition. My workstation main PC here is still on Linux Mint 17 Cinnamon ( since December 2014 I think, and previous distro was Xubuntu 14.04LTS, so I'm sticking with 14.04 packages since almost 2 years, I'm not really distro jumping anymore ). I'll follow the 16.04 LTS series in April. I had the new 17.1 , 17.2 Mint and last weeks 17.3 via update , without reinstall, and it was smooth each time. I trust the Mint team now, I never experienced this on Linux before. That's why I'm sticking to Mint for my main productive distribution. The library didn't changed this much, so I even could develop advanced habit and bash script to boost the productivity on Pepper&Carrot. Do you like miyazaki style? Really great workflow tips. Thanks for the great help you provide by your post. it's very useful - finally I can sort out mess in kra files. @Wahffle : aww... Too bad to learn about this ; I hope Elementary team will keep in sync with Nemo and Nautilus about the spec/standards for the Elementary 'files' thumbnails generator. Thanks for the feedback about it. Seems that it can work almost right away, without restarting the computer, by just restarting the file manager (in my case, Caja)! I cruelly "restarted" it by killing Caja's process in the System Monitor's resources tab, since Caja relaunches automatically (I assume all file managers do this). 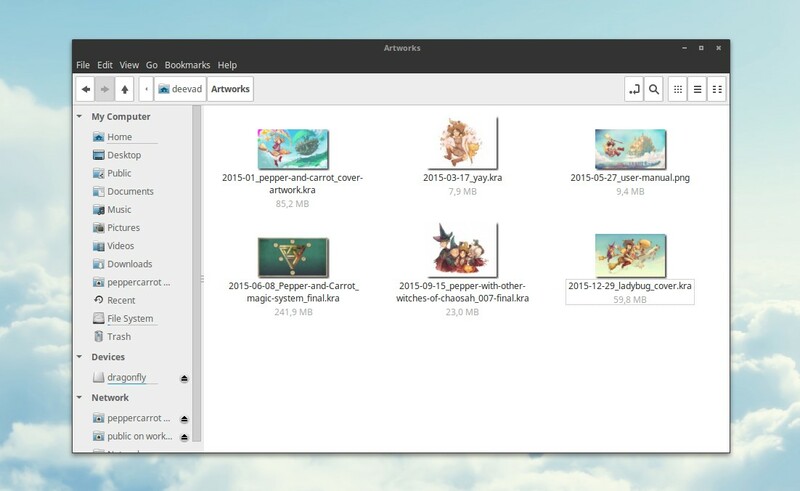 Thank you for the feedback about MATE desktop environment, I didn't tested this thumbnailer on MATE, and I thought MATE developers kept the old GTK2 way to manage thumbnails. I was wrong, it's mean now the thumbnailer works for Nautilus, Nemo, Caja, PCmanFM. Good! The thumbnailer is also now in AUR for Arch/Manjaro/Antergos/AprilOS users , and in Fedora official repositories. Good news for this piece of code. If you filemanager auto launch after killing it, it's probably because the filemanager is needed for something else. I guess in your case, the management of desktop icons. So, there is a daemon running to recover Caja in case of crash or not running, for not leaving the user with a empty dekstop after a little crash. Antoine, don't say 'avoid' because the information on this page still works. If you use XFCE ; your filebrowser is probably Thunar. This page doesn't offer a solution for Thunar. It's clearly written it's for Nautilus and Nemo file browser. Yes, I'm using Nemo in Manjaro XFCE. Feel free to add your voice to this feature request ; maybe a developper will consider it more if I'm not alone to ask about it. Works great in Ubuntu 16.04, thanks! Works perfectly in Linux Mint Cinnamon 18.2, thank you!